It’s very important to dispel the myth that flossing is simply a routine that is done in addition to brushing your teeth. Instead, it should be held in the same regard as your brushing routine. Your dentist in Zionsville will explain why as he reveals 4 reasons that you should floss every day. In addition, he’ll discuss how your oral hygiene habits and preventive dentistry work in tandem to maintain your oral health. The 40 Percent Rule – When you brush your teeth, you are only able to clean 60 percent of the surface. Thus, a third is left as open prey to the attacks of bacteria, which then defeats the purpose of brushing. To fully clean your teeth, you must be able to get into the crevices between them, where your toothbrush can’t maneuver. Plaque Removal – When you get into these tight places, you’ll be able to remove a great deal of plaque. This is the sticky substance that results from the accumulation of over 300 bacteria. This amalgam of goo then goes on to emit acids that bore into your teeth and below the gum line. Again, this is preventable by flossing daily. Healthy Gums – Another danger of plaque development is that it eventually leads to gum disease, a condition where the soft tissues become inflamed from bacterial infection. 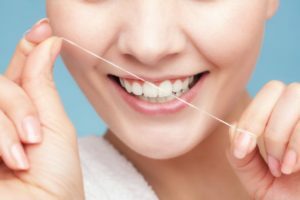 Thus, when you floss you’ll prevent bacteria from seeping into the pockets between your gums and the roots of your teeth that can lead to tooth loss. Fresh Breath – A final benefit of flossing daily is that it contributes to fresh breath. So if you’re wondering why your brushing efforts don’t seem to eradicate unpleasant odors, it may be because there is decaying food particles and bacteria wedged between your teeth. So incorporate flossing into your daily regimen to give your breath a boost of freshness. How Does Oral Hygiene Work with Preventive Dentistry? Your oral hygiene provides the consistent, daily activity that will help to keep your mouth, teeth and gums healthy. It works in a perfect tandem with your semi-annual visits to your Zionsville dentist to ensure your continued wellness. These appointments are important because no matter how noble your oral care efforts are, there’s always a chance that a cavity could be lurking, and the quicker it’s identified and fixed, the less damage it can cause. Furthermore, sometimes there’s plaque and tartar development that you’re not aware of. They’ll be addressed with the thorough cleaning that you’ll receive. So take advantage of the opportunity you have to enjoy the perfect marriage between improved dental hygiene and preventive care. Make the slight changes in your daily habits mentioned above and reach out to your local dentist to schedule your first visit! A graduate of the Indiana University School of Dentistry, Dr. Angelo M. Julovich has over 30 years of experience providing excellent dental care. A passionate professional who has been voted Top Dentist for the 9th year in a row, Dr. Julovich practices at Trinity Dental and can be reached for more information through his website.